This party tent is one of the sturdiest party tents on the market and is made to withstand multiple set ups and take downs for commercial and industrial use. The tent canopy is a heavy-duty "Block Out" top that comes in solid white or white with red, green, yellow, or blue vertical stripes. 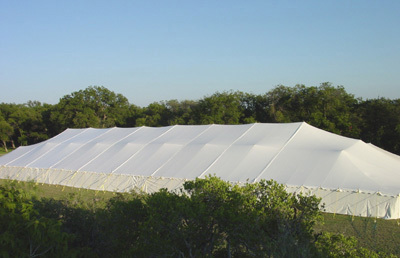 The tent's center and quarter poles have a welded plate at the top and bottom and a pin welded into the top. The side poles are also extremely durable, but they are lightweight for easy installation.